Microsoft has heavily promoted Windows 10 since its launch and was keen to provide free upgrades to its latest OS to anyone using Windows 7 or newer for a whole year. However, even after that time was up it became common knowledge that users could continue to upgrade for free as long as they claimed that they used some of Windows Accessibility features – whether they had some kind of medical condition that predicated such usage or not. It was a loophole of sorts but the assistive technologies upgrade site was worded so that it was easy to upgrade this way without any inkling of deceit. The above last avenue of free upgrades to Windows 10 was supposed to close on 31st December 2017, just passed. However MSPowerUser noticed the page is still available and the upgrade is still working for those interested. 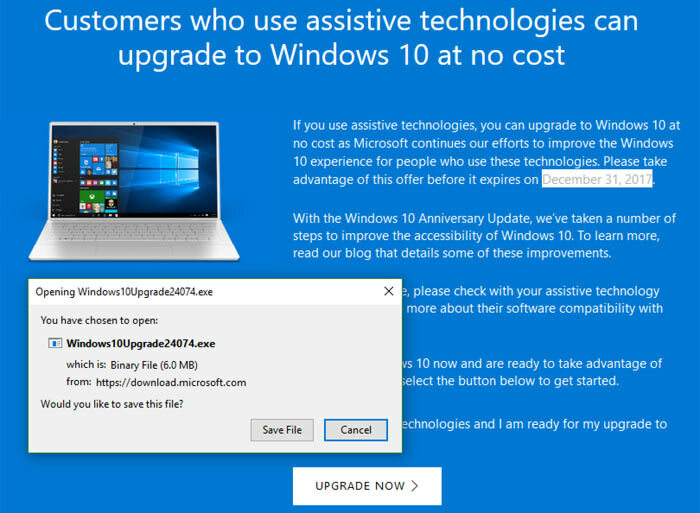 This is despite the free Windows 10 Assistive Technology upgrade offer page still actually citing 31st December 2017 as the cut-off date. If you want to go ahead with this update now, there’s a small bit of file manipulation required before you go ahead. MSPowerUser user comments mention that your upgrade might be stopped with a ‘missing libraryloader.dll’ issue – but it’s a simple fix to Replace C:\Windows10Upgrade\wimgapi.dll with the one from your C:\Windows\System32\wimgapi.dll and the upgrade will roll forward without issue from then on. Further user comments indicate that using an existing Windows 7 or Windows 8.1 product key to activate an installation of Windows 10 still works, as an alternative route to upgrading. I don't think they ever ended the normal free upgrade path as only 2 weeks ago I activated a clean install of windows 10 using the OEM windows 7 pro license key I had on the laptop without any issues at all and have activated many others since the proposed free upgrade period ended. If that copy of Windows was originally upgraded during the free upgrade period then the key will be registered with MS as valid for Win 10 installs, and you'll have no issues using it to install Windows 10 on the machine the OEM license is valid for. If you're using the key to install Windows on another machine, or on multiple machines simultaneously, then you're breaching the EULA and could be liable to legal action anyway, whether it technically works or not…. They've now updated the date and it now expires on 16th Jan 2018.